American toads are approximately 51-90 mm (2.0-3.5 in) in length and have a brown or gray coloration, although some individuals may even be reddish (brick red in the extreme case), olive, or tan. Their base color is often accented with yellow or tan patches that contain randomly distributed dark spots across the back in most cases. A light stripe extends down the middorsal. The venter is light with numerous dark markings. American toads are sexually dimorphic – males are typically smaller than females and have dark throats during the breeding season. The skin of these toads is dry and densely covered with warts. Encountered infrequently during the summer, American toads are inactive during hot, dry periods and from late fall until breeding begins early in the year. They are most active at night, spending the day hiding in burrows or underneath logs, forest ground litter, or rocks. These toads show hiding spot fidelity, sometimes returning to the same location every day. During the non-breeding season, individuals have a home range of several hundred square feet, but adults may travel more than half a mile during the breeding period. Adult American toads eat a variety of small insects including ants, beetles, moths, and earthworms. Tadpoles consume aquatic organic matter such as algae, detritus, dead fish, or other tadpoles. 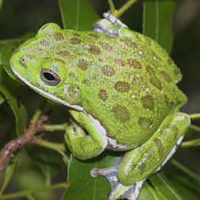 Barking Treefrogs are the largest treefrogs in our region, averaging over 2 in (4.4 cm) in length. They are heavier-bodied and have more granular skin than green or squirrel Treefrogs, with which they can be confused. They are often bright green in coloration and usually have dark, round spots on their back and a white line on the lip that continues down each side. Barking Treefrogs spend much of the year high in trees and are most often seen during the breeding season when they congregate at wetlands. Breeding lasts from March to August, but calling is most intense in the early summer. Unlike most treefrogs in our region, males call from the water, often resembling tennis balls as the float, inflated, on the surface of wetlands. 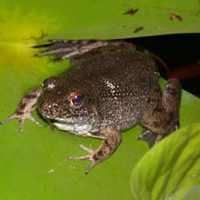 A medium-sized frog: 7.5 to 12.5 cm (3 – 5 in), with dorso-lateral ridges that are well-defined, extending from the back of each eye down the back. The toes are extensively webbed and the second toe is longer than the first. Coloration is dark green but some individuals are more brown or yellow, and all have small irregular black spots and a white to yellow ventrum. Although found close to water, during heavy rains, juveniles may move into wooded areas or meadows. During the winter, Rana [L.] clamitans will bury themselves in the mud at the bottom of the pond or marsh to keep from freezing. 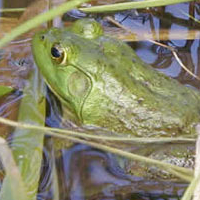 The bullfrog is the largest frog in the U.S., ranging in length from 3.5 – 8 in (9 – 20 cm.). Coloration is normally plain green above, or a netlike pattern of gray or brown on a green background. The venter is whitish and often has grey mottling with a yellow wash, which is evident on the throats of adult males. 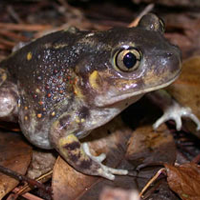 In the southeastern part of the bullfrog’s range, coloration can be a heavy pattern of dark grey, brown, or black above, and thick mottling below. Although highly aquatic, Bullfrogs may be found moving about on land at night or in wet weather. They are often seen at the edge of ponds and lakes amidst emergent vegetation. Bullfrogs are voracious predators and will attach nearly anything that they can fit in their mouth including insects, other frogs, salamanders, small snakes and turtles, and even small birds. Breeding occurs in late spring and summer. Rather than forming large breeding choruses, male bullfrogs call sporadically throughout the breeding season. Each female lays 15,000 – 20,000 eggs each summer. Tadpoles attain very large sizes and take 1 – 3 years to metamorphose. Gray Treefrogs are the fairly large treefrogs (1.25 – 2 in; 3.2 – 5.1 cm) with large toe pads and granular skin. They are heavier-bodied than Pine Woods or Squirrel Treefrogs, with which they can be confused. They vary in color from mottled gray to light green but their color can change depending on environment and activity. There is usually a light spot beneath the eye, and the inner thigh is bright yellow or orange when exposed. 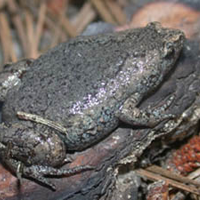 Gray Treefrogs spend much of the year high in trees and are most often encountered during the breeding season when they call from vegetation surrounding wetlands. Breeding lasts from March to August, but calling is most intense in the early summer. 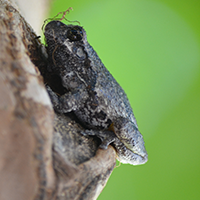 Gray Treefrogs spend the day hiding in tree holes or other secluded areas and emerge at night to feed on insects and small invertebrates. Narrowmouth Toads are small, flattened frogs with pointed snouts and a fold of skin across the back of the head. They are typically around 1-1.5 in (2.5-4 cm). Overall color is generally gray to brown but can be extremely variable and can change from day to day or with the mood of an individual. The belly is usually heavily mottled. Narrowmouth Toads are secretive and are usually found by overturning boards or logs in woodland habitats. They feed on a variety of invertebrates but particularly ants. This species breeds in the summer and adults congregate at temporary water bodies, including large puddles and roadside ditches, to breed on rainy summer nights. Males call with only their snout protruding from the water and are often hard to locate. Eggs float on the surface of the water and tadpoles take 20-70 days to metamorphose. The Eastern Spadefoot Toad is a large toad, ranging from 1.6 – 3.1 in (4 – 8 cm) long. Their skin is smoother and moister than other toads and is speckled with tiny warts. 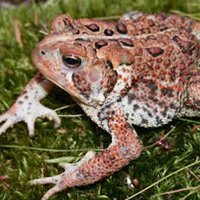 This species varies in coloration tan or yellowish to dark brown, without bold spots (as in other Southeastern Toads). They usually have two vertical light lines running from the back of their eyes down their dorsum, forming an hourglass shape. The lines are more brilliant yellow in males. The characteristics used to immediately distinguish this species from other species of toads are their bright yellow eyes with elliptical pupils (like cat eyes) and the dark spade, which is used for digging, on each hind foot. Spadefoot toads are extremely fossorial, spending most their life buried underground and are explosive breeders. Heavy rains, occurring at nearly any time of year, cause them to emerge in large numbers and congregate at breeding in wetlands or ephemeral pools created by the rain. Males call while floating on the surface of the water. Females can lay up to 2,500 eggs at once. Tadpoles grow very quickly and can undergo metamorphosis in as few as 28 days. Data from the Savannah River Ecology Lab have shown that this species is very long lived and populations often go for many years without successful reproductive events. The green treefrog is a medium-sized – 1.25 – 2.25 in (3.2-5.7 cm) frog that, like other treefrogs, has long limbs, long digits, and sticky toe pads. 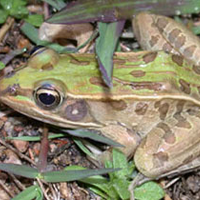 This frog is green with a white, yellow or sometimes iridescent stripe along each side of the body. The length of these stripes varies among some populations and, indeed, may not be present at all. Additionally, yellow flecks are often found on the dorsum of some individuals. Males are smaller than females. 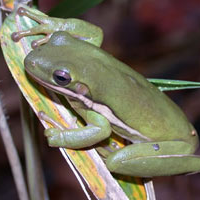 Green Treefrogs are arboreal and spend much of their lives in trees. They are also frequently encountered near porch and patio lights throughout the south during warm, wet weather; they enjoy the abundant supply of insects attracted to the light. They are nocturnal animals and males call while perched on plants adjacent to water (up to 5m high) or from floating vegetation. The calling season extends from March to October. This species is more resistant to fish than many amphibian species in our region. Southern Leopard Frogs (Rana [Lithobates] spenocephala) are mid-sized frogs — 2 – 3.5 in (5.1 – 8.9 cm), that are brownish to green in ground color with large dark green to brown spots on its back, sides, and legs (spots on the sides and legs may be smaller than those on the back). The upper jaw has a light, sometimes yellow stripe. Although Leopard Frogs are often found close to water, they are more terrestrial than other ranid frogs and can often be found far from water. They are active both by day and night and can be seen in large numbers on rainy nights. Leopard frogs breed primarily in the winter and spring but sometimes breed again in the fall. Often a heavy winter rain will prompt explosive breeding in this species. 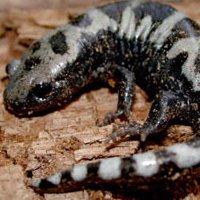 Marbled Salamanders grow to about 3.5-4.25 in (9 – 10.7 cm) in size and are stout-bodied and chubby in appearance. They can be identified by their black/dark brown body (including its venter) with light white/silvery crossbands on the dorsum. This species is sexually dimorphic, males tend to have white crossbands and females tend to have gray/silvery crossbands. These crossbands, though, are not present in newly transformed juveniles, which have flecks instead. Adult Marbled Salamanders are nocturnal and burrow or take refuge under logs or other cover during the day. They are perhaps most often encountered when they migrate to wetlands to breed on rainy nights in September and October. Marbled salamanders breed in autumn (unlike most other mole salamanders which breed in winter) and migrate to wetlands during/before a good rain to court and mate. Females will lay about 30-100 eggs in a depression on land (usually beneath a log or leaf litter). The female stays with her developing eggs until rain fills the wetland and triggers the eggs to hatch. If the rain never comes, then the eggs have the ability to over winter until spring to hatch. Salamandrids are collectively known as the “newts,” a term which often breeds some confusion — as in “What is the difference between a salamander and a newt?” The simple answer is nothing: a newt is simply a specific type of salamander, namely members of the family Salamandridae. 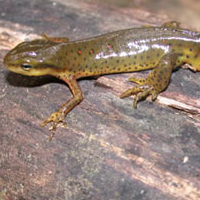 In other words, all newts are salamanders, but not all salamanders are newts. Adult river frogs (Rana [Lithobates] heckscheri) are large frogs, ranging from 3 to 5 inches (7-13 cm) long. The record length is over 6 inches (15.5 cm). The dorsal surface can vary from green, dark green, to greenish black. The venter can be almost completely black, but is usually medium to dark gray. The belly also has short wavy lines or light spots. These frogs are nocturnal and are more easily approached than other frogs. Instead of fleeing, river frogs will often play dead and go limp or secrete an unpleasant odor. They breed from April to early August. 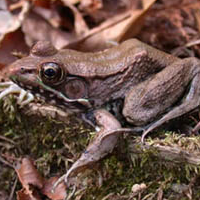 The large tadpoles of river frogs can reach a size of up to 5 inches. The tadpoles also demonstrate schooling behavior, which is uncommon among frogs with large tadpoles. Spotted Salamanders are a large salamander, ranging from 6-9.5 inches (15-24 cm) in length. Ground color can be shades of black, gray or brown on its back, gray on its belly. Down each side of the back, there are two rows of orange and yellow spots; sometimes as many as 50. Ambystoma maculatum is considered monotypic (no recognized subspecies) and has 12 costal grooves. 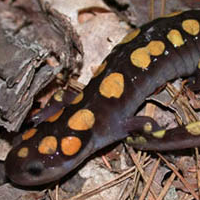 The Spotted Salamander is fossorial, active at night, and is rarely seen except during breeding seasons. They breed during the winter and early spring when adults migrate from their burrows to pools during winter rains. They exhibit courtship breeding patterns and internal fertilization. Females lay large clumps of up to 200 eggs in shallow pools, often associated with algae. There is believed to be a symbiotic relationship between the algae and the salamander, where the algae are provided with a safe place to live and grow and in turn, algae produce oxygen, which is needed for embryonic development of the larvae. Eggs hatch in four to eight weeks, and larvae metamorphose in two to four months. Adults can live for two decades. 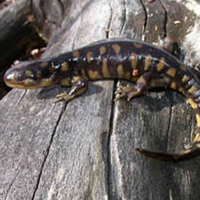 In other parts of its extensive range, the tiger salamander may be the most frequently encountered salamander. In the Southeast, however, it is less common. Tiger salamanders are usually found as eggs or larvae instead of adults, in temporary and permanent ponds that are open and grassy. Unlike in other parts of its range, tiger salamanders in the Southeast appear to be incapable of paedomorphosis, and the famous “cannibal morph” has not been collected in the eastern United States. The larvae have astounding growth rates and can achieve metamorphic size (up to 5 or 6 inches) in just a couple of months. These are the largest terrestrial salamanders on in the southeast and may approach 8 inches in total length. Adults are usually black with yellow markings that may come in the form of spots, blotches, bands or even short stripes.